Would Tina Fey Be A Star If She Still Looked Like This? Commentary on the Tina Fey Vanity Fair cover is still rolling in, and most people are remarking on what Salon refers to as "The sexing up of Tina Fey." Salon's Sarah Hepola mentions Vanity Fair's focus on Fey's recent abundance of cleavage and her pre-SNL weight-loss. "Maybe you find this depressing (a brilliant comic mind inevitably reduced to shaking her cleavage). Maybe you find this empowering (a brilliant comic mind finally shaking her cleavage! )," Hepola writes, but in fact, it's neither. It's ambition, pure and simple. People who want to succeed in their chosen field do whatever they can to make themselves most "attractive" to employers. In fields that aren't acting and modeling, this means garnering experience that's most relevant to the position you want. However, as much as we may or may not like it, acting is job that is based on looks and polish — she wasn't applying for a job at a law firm or at a radio station. 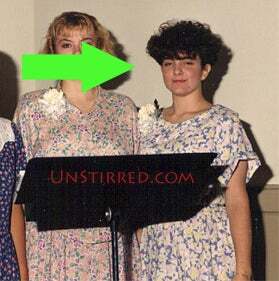 Was Tina Fey still hilarious when she weighed thirty pounds more and had terrible hair? Undoubtedly. Would she ever have seen screen time? Never in a million years. Can you really blame her for the choices that she made? As our own Macloserboy eloquently noted yesterday, "Sadly, the whole physical transformation thing matters because if she didn't do it, there's a chance that no matter how smart or funny she was (and Lorne Michaels makes it clear they thought that even when she was heavier) we wouldn't even know her name. We'd just marvel twice as much at Amy Poehler who'd essentially be her mouthpiece." More pics of Tina pre-makeover are below, plus a video of the very glam Ms. Fey dancing whilst getting photographed for Vanity Fair.